The K.A. Artist Shop have created an all-around art space, both in-store and online, where their customers can find their favorite art supplies, learn about new crafts, get creative with custom design services, enjoy their gallery, find a great gift, and get inspired in the store’s colorful space! The K. A. Artist Shop work hard to grow and maintain their customer relationships. Kristen and her team provide friendly and knowledgeable customer service, and they offer quality products, great teachers, and a customized Marsello loyalty program filled with generous rewards. Kristen has put her creative flare to use by designing an eye-catchingly colorful program. The K. A. Artist Shop have clearly illustrated why they offer a loyalty program; they want to say an enormous thank-you to all of their loyal customers, and it's right there framing their loyalty widget. They've made a specific logo for their rewards program and the pops of color and calligraphy they’ve used help to encourage their customers to sign up, start earning, and check their points and rewards. The K. A. Artist Shop have even customized their widget tab with inspiration from a bit of clickbait – they've used the same colors from their widget and the sparkle emoji. This helps to catch their customer’s eye and encourage shoppers to sign up so that they’re earning points with every purchase. The K. A. Artist Shop launched their loyalty program on their Instagram page to a great response. They used their colorful loyalty program logo, along with a lovely introduction to their program. To get their creative customers involved in their program launch, Kristen added a comment to the post, encouraging customers to come up with her points label. We love this idea! Along with The K.A. Artist Shop eCommerce store, they also have a creative brick-and-mortar store. 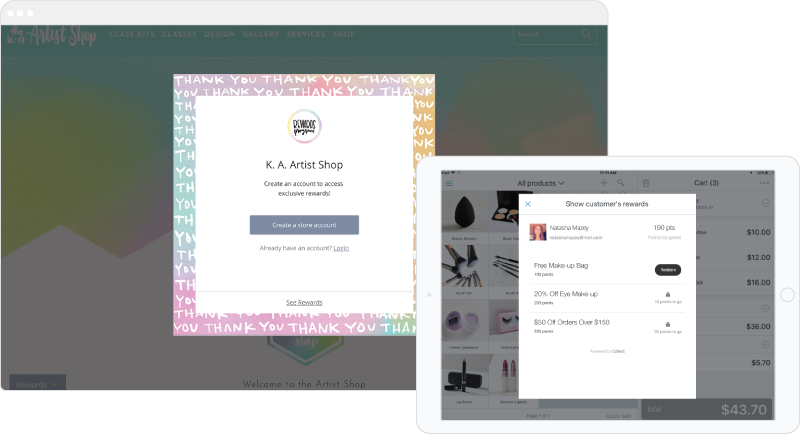 They wanted to be able to run one loyalty program across both their sites, so their members can earn points and redeem rewards when and where they want to. “I love being able to reward my best customers with coupons. When regulars check out online, and I'm not able to give them a little discount in person, this app does it for me! The Marsello app makes it so easy for me to thank my regulars for their continued business. Nothing expresses a heartfelt ‘thank you’ like a free gift!" The K. A. Artist Shop host loads of art events to bring the creative community together and showcase local talents, with people leaving inspired. They even go further and share these events on their social media so that their community feels involved, up to date, and invited. The K. A. Artist Shop has some of their outstanding customer reviews on display on their online store. They have a range of reviews about their customers' experiences in-store, product reviews, classes, and more. This is another creative idea to increase trust and encourage first-time customers to buy. We also love the way they’ve customized the reviews to integrate their branding and design.